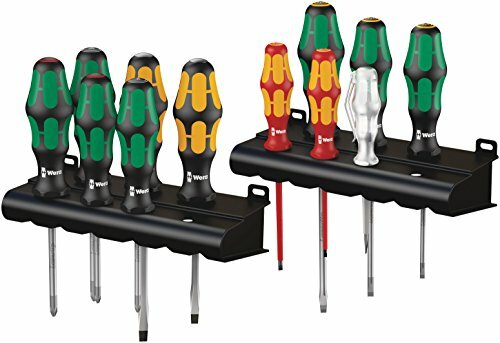 12-piece all-round screwdriver set. Kraftform Plus handle for pleasant, ergonomic working that prevents blisters and calluses. Hard gripping zones for high working speeds whereas soft zones ensure high torque transfer. Partially with Laser tip: The tips of the Wera Laser tip screwdrivers are microscopically roughened by laser beams. This rough surface literally bites into the head of the screw. Any unintentional slipping out is therefore a thing of the past.